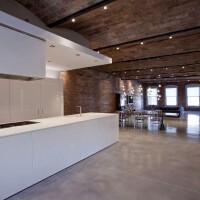 Naiztat + Ham Architects designed a loft interior in Manhattan, New York. 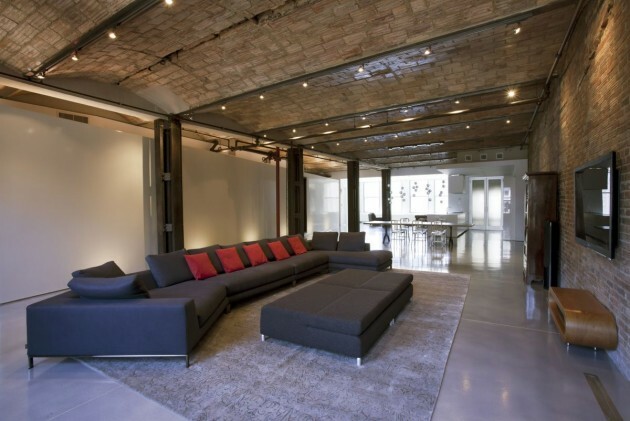 This 3600 square foot loft in the Union Square Area of Manhattan exemplifies the industrial era it was born out of. Its tall vaulted ceilings, structural steel columns, floor-through configuration and open feel were hidden by years of adhoc and maze-like modifications. Both the Architects and the Owners saw the potential in this jewel but understood also that there was a need for luxury in its utilitarian functions. 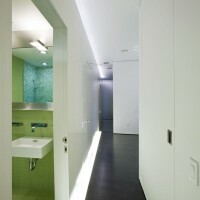 The first idea was to open up the space, expose all the elements that were inherent to the building (i.e. brick and terra cotta walls and ceilings, columns, etc.). The second was to place modern and simple interventions into the loft’s envelope to define living spaces without doors or other conventional methods of closure. Bathrooms – The free-standing wet volume, skewered by a wood portal, houses two-and-a-half bathrooms, the laundry room and storage. The Architects treated this volume as a “fruit”, with a slick, white architectural skin and the interiors of the rooms as its colorful pulp. 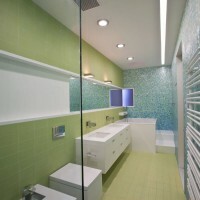 In a loft of natural colors and materials, the bathrooms are the color-burst and jewel. 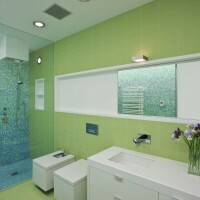 All the bathrooms are treated with the same tiles and variations of the same fixtures – always emphasizing the contrast of the white (fixtures) against the color (tile). This interior wet volume is shorter than the structural ceiling and borrows natural light through a skylight over the tub and an obscured-glass window which is part of the mirror element wrapping the bathroom wall. The master provides luxury with a full walk-in shower, heated towel bar, double sinks, bidet, radiant floors and soaking tub. 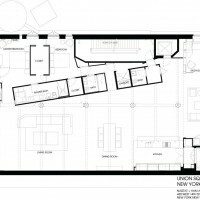 Kitchen – The Architect found a home for the kitchen adjacent to the freight elevator (where the garbage is picked up daily by the building’s super). Although this was a logical and comfortably nestled spot for this minimalist Boffi Kitchen, the team felt it was unfortunate that there was no natural light. With the help of a cooperative building, the freight elevator doors were replaced with new fire-rated glass doors, so that when the freight elevator is not on the floor, the light from the window in the shaft extends into the kitchen. Again, acting as a modern intervention in this rustic interior, the Kitchen is meant to be more “Architecture” than “Kitchen”, with only the sink, stovetop and hood visible. The sliding doors along the wall have a mechanism which allows the lacquer doors to pop forward and slide over one another, hiding or revealing the refrigerator, wine refrigerator, ovens, microwave, pantry, and ice maker. The island’s seamless Corian countertop folds down on both the north and south sides nesting the white lacquer cabinets in the middle. To maintain the integrity of the white kitchen object, minimalist hardware was used and only touch latches for the front of the island, helping it read as a solid block. 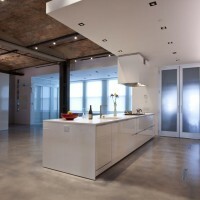 The white of the kitchen is a stark contrast to the terra cotta walls and gray concrete floors. The kitchen is both beautiful to look at and functional; it works to prepare a dinner for 20 or just to heat-up NYC’s menagerie of takeout. Visit the website of Naiztat + Ham Architects – here.